You can eat healthfully in fast food restaurants, but you have to be careful what you choose. The calorie content of fast foods is notoriously variable. This means that if you're a busy dieter on a budget, a fast food calorie counter is essential. Although a customer-friendly restaurant may publish such a counter on its website or in the restaurant itself, the average restaurant does not. In a study of the top 100 chains in the United States, my company found that only 32 made their nutrition facts easy to locate. That's one reason we added fast foods to DietPower®, our weight loss and nutrition software, more than ten years ago. Ask when the calorie counter's food database was last updated. Fast food restaurants regularly introduce new menu items or adopt new suppliers. If your calorie counter calculates a calorie budget for you, check it against the budget provided by the DietPower calorie budget calculator. The results should match within 100 calories. If they don't, your counter may be one of many who aren't careful about their math. Most people eat at least 20 different foods each day. Logging them can become time-consuming if your calorie counter's search function doesn't minimize scrolling, and clicking. Choose one that doesn't ask you to specify a category for each food search (are hashed browns a Vegetable or a Side Dish?). See if it can find a food in less than one second, even if you misspell its name. A really good calorie counter will also remember your favorites and put them at the top of the list when you do a keyword search. Most fast food restaurants publish data for only a few nutrients. Nevertheless, some calorie counters include additional nutrients, so that you can track not only your calories, fat, sodium, and carbohydrates, but also cholesterol, calcium, folic acid, potassium, zinc, selenium, and several dozen other key nutrients. In addition, some counters track calories that you burn in exercise, adding them back into your daily budget so you can eat more and still reach your goal on schedule. In a few cases, calorie counters actively recommend foods that are best for your nutrition. DietPower is one of these. Based on your nutrient balance, for example, it can show you which fast food is best to have seconds in. DietPower also monitors your metabolism and automatically tweaks your calorie budget to keep you tracking precisely toward your goal. It even adjusts the budget for water loss from high-temperature exercise, as well as water retention from high sodium intake (a common problem for fast food eaters). *Terry Dunkle is a 30-year veteran medical journalist and consumer advocate who serves as CEO and chief editor at DietPower, Inc., a leading maker of nutrition and weight-loss software. To comment on this page, click here. 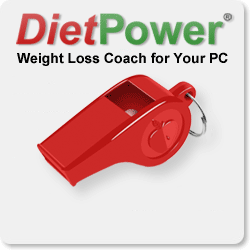 suspect that someone has subscribed you to our mailing list fraudulently, email us at webmaster@dietpower.com. Copyright © 1992-2016 by DietPower, Inc., 7 Kilian Drive, Danbury, CT 06811. Phone 800-852-8446. All rights reserved. The name DietPower and the apple and runner symbols are trademarks of DietPower, Inc. Information on this site is meant to increase your awareness of the importance of nutrition to health. It is not meant to substitute for the advice of a health professional.